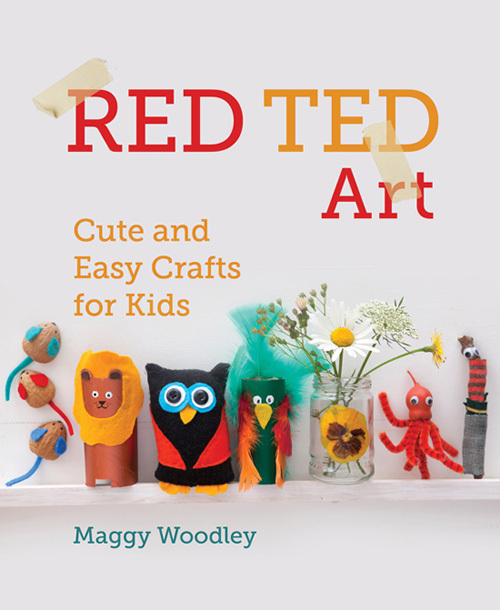 The kids and I were thrilled to receive a copy of Maggy Woodley's book Red Ted Art: Cute and Easy Crafts for Kids. This is a book with something for everyone – it is a book of crafts to make with kids and a book of crafts to make for kids. 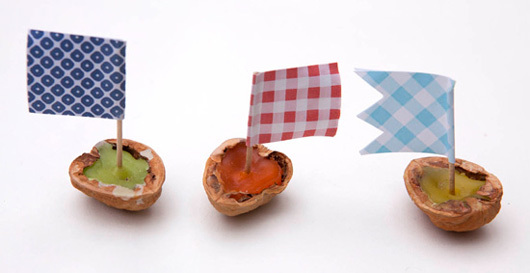 PROJECT #1: The first project from the book we set about making were the walnut boats. I bought a bag of walnuts from our local green-grocer. Using a nut cracker I carefully broke one side of the walnut – salvaging the other half to use for a boat. The girls made flags for the boats using colourful scrapbooking paper, pva glue and toothpicks for the masts. 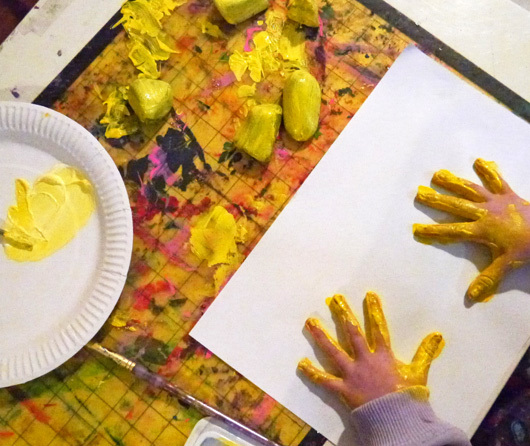 Maggy suggests filling your little boat with either melted candle wax, Blu-tack or playdough. 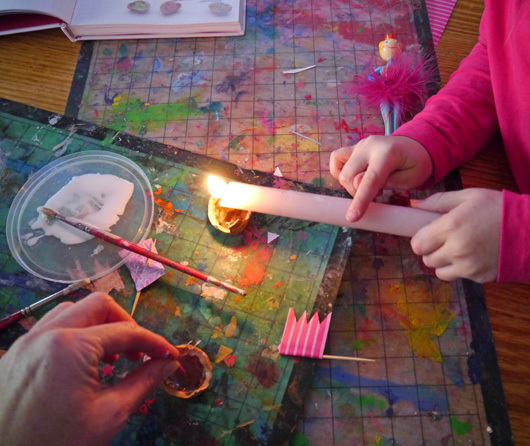 I gave Boo Blu-tack to squash into her boat while Cakey and I experimented with melting candle wax into the little nuts. At first I thought it was going to take a long time for the wax to fill the walnut shell but once the candle got going it took no time at all. After doing the first one myself, I handed the candle over to Cakey to fill all the walnut shells. I got the job of holidng the flag in the middle of each boat while the wax dried around it. 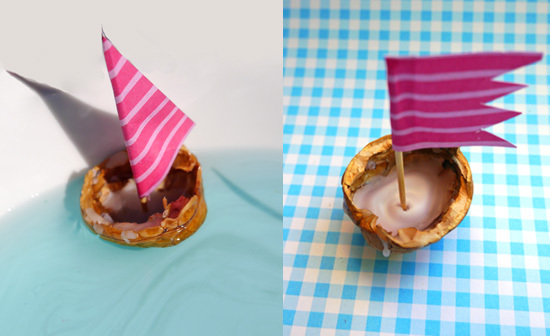 We made a handful of walnut boats and then sailed them in a bowl of water. Boo's Blu-tack filled boat sunk.... we called it the shipwreck... and we sailed the wax-filled boats around it. 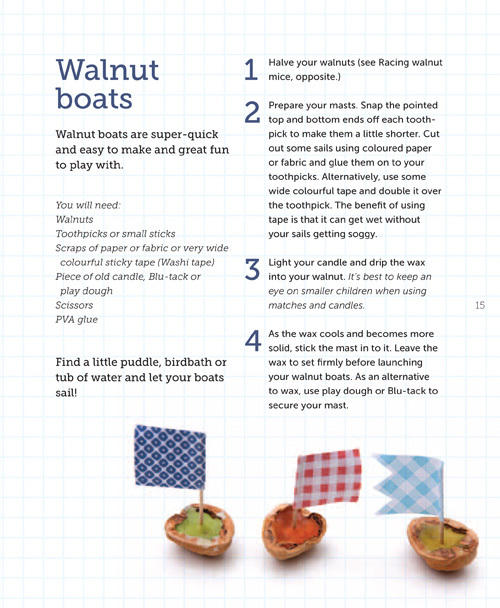 Download the free Walnut boats extract from Red Ted Art: Cute and Easy Crafts for Kids here. PROJECT #2: As soon as I saw Maggy's Five Little Ducks in the book I really wanted to make them myself! 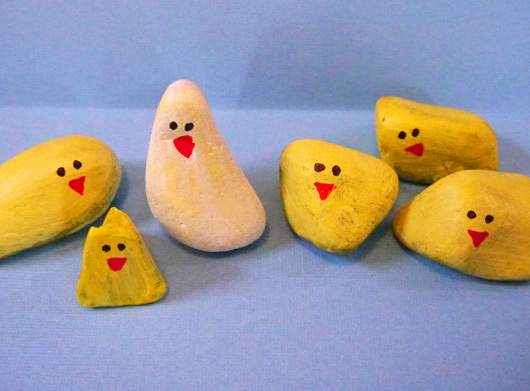 The kids insisted on helping.... so together we chose our rocks from the garden and painted them yellow and white. Each rock got two coats of paint. Once they were dry I drew on their little duckie faces with permanent markers. Our little ducks have been given a home in a blue paper pond. THE BOOK... 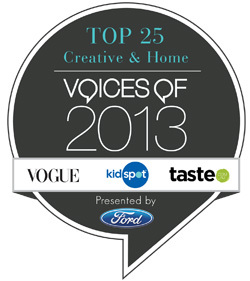 There are tonnes of crafty ideas in this beautifully presented book. It is easy to follow with step by step instructions for each project. There are lots of 'my type of crafts' – making fun things from paper, stones and sticks. And.... if you are handy with a needle and thread then you will be happy indeed with gorgeous projects like felt doughnuts and strawberries. Red Ted Art: Cute and Easy Crafts for Kids is available to order online through Fishpond (with free international shipping). It is also available from some independent book retailers here in Australia so keep your eye out for it. You can purchase an ebook copy from here. Awwwww I adore your boats, but I ABSOLUTELY LOVE your ducks (and hehehehe we ended up with ahem very yellow hands too.... the things we do?!). 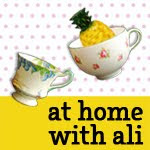 Thank you so much for a super kind review and so pleased you enjoyed the crafts! !